Je vous propose mon nouveau menu français pour la nouvelle année. Si vous voudriez commander un livraison, c’est très simple : cliquez au lien ci-dessous, regardez le menu, choisissez ce que vous voulez et me donner votre commande au 05.53.05.28.47. Le livreur acceptera votre paiement en espèces ou par chèque. Nous sommes ouvert de 16h30 à 20h30 jeudi à samedi. Stage 1: Boil a kettle and pour boiling water over the duck. This tightens the skin, allowing it to become crispier. Let it dry, then rub the whole jar of five-spice over and inside the duck. Leave to marinate for at least two hours (up to 12 if you like). Stage 2: Steam the duck for 3 to 3½ hours. Leave it to go completely cold. Stage 3: Roast the duck in the oven pre-heated to 180-200 degrees C for 1 to 1½ hours, by which time the skin should have crisped up nicely. 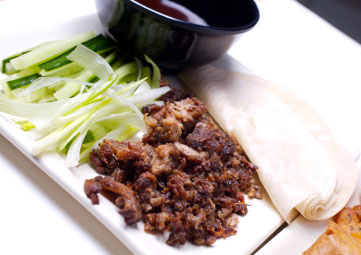 Remove from the oven and leave to rest for 15 minutes, then take two forks and twist to shred the meat, then serve accompanied by the pancakes, Hoisin and the julienned cucumber and spring onion strips. It’s such a lovely meal to share – everyone enjoys filling the pancakes their own way. And with this method, the preparation doesn’t take all the fun out of it for the cook! Here’s a revised menu for the New Year (please use the link below). As a special deal this month, I’m doing a Chicken Dhansak meal for 2 people for €25, saving €6 on the individual prices for the various elements, which also include Popadoms and Pickles, Pilau Rice and Vegetable Curry. I’ve also dropped the delivery charge within 10km of Sainte-Orse. This is what we had for Christmas dinner, but it’s a wonderful recipe for any celebration meal or for high days and holidays. People tend to be put off making it because they think it’s long and involved, but really it’s just about organisation and can be done in three stages – stages 1 and 2 the day before, leaving stage 3 for the day itself. You’ll be amazed by how tender the beef becomes and how the pastry remains moist but not soggy, thanks to the Parma ham”lining”. Stage 1: Melt half the butter in a frying pan and, when hot, brown the fillet steak on all sides. Remove from pan and put – uncovered – in a roasting tin in the oven (preheated to 180 degrees C) for 20 minutes (for medium cooked). Remove from the oven and leave to go completely cold. Stage 2 (the Duxelles): Melt the remaining butter in a frying pan and add the chopped mushrooms, shallots and garlic. Fry until all the liquid has evaporated from the mushrooms. Season, add the thyme and mash the chicken liver pâté into the mushroom mix (the Duxelles) and leave to go cold. Stage 3 (assembling the Beef Wellington): Roll out the puff pastry on a lightly-floured board till about 3mm thick and big enough to encase the meat. Spread the Duxelles mix evenly over the centre of the pastry, leaving approx 1″ of pastry around the edges. Lay your Parma ham evenly on top of the Duxelles. Rub the Dijon mustard all over the beef and place it in the middle of the pastry. Bring up the sides and ends of the pastry to completely encase the beef – seal the joins with beaten egg. Turn your Wellington over, so that the seams are underneath. Brush with beaten egg. Chill in the fridge for 30 minutes or overnight. Pre-heat the oven to 200 degrees C and cook for 40 minutes. Remove your finished Beef Wellington to rest in a warm place for 15 minutes before serving. We decided to have Beef Wellington for Christmas lunch. It’s a bit fiddly to prepare, but the results were fantastic. Beautifully tender fillet inside a duxelles of musthrooms, inside a puff pastry crust. I wrap the beef and mushrooms in parma ham, which stops the pastry getting soggy, but that’s my taste – it’s not essential. 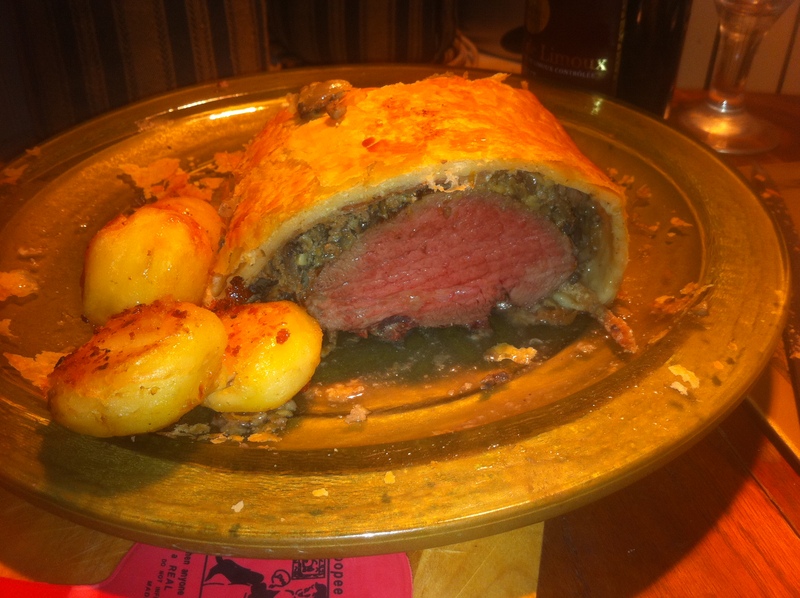 I’ll post the recipe soon, because a Beef Wellington is not just for Christmas! In fact, because we ended up decorating the crust with a six-pointed pastry star (holly leaves defeated us), it looked more like a feast for Hanukah! As you can see from the picture, there was plenty for all and a bit left over. I hope you enjoyed your Christmas Day as much as we did – happy holidays, Bonnes Fêtes et Bonne Année! Because we’re off early in the morning, I don’t want to be faffing about in the kitchen for hours tonight, so I’m doing one of my favourite and simplest recipes – Vietnamese Caramel Pork. There’s only six ingredients – what could be easier? 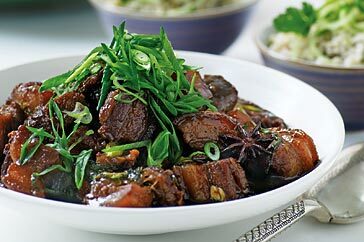 For 4 people: 6 garlic cloves finely chopped; 500 grams shoulder or leg of pork, cut into thinnish strips or smallish cubes; 1 tablespoon oyster sauce; 1 tablespoon light soy sauce; 1 tablespoon Thai fish sauce; 4 tablespoons palm or soft brown sugar – and that’s it! Method: put two tablespoons of vegetable oil in a wok or large frying pan on a medium heat. Stir-fry the garlic until light brown, then add the pork and stir-fry for a few minutes. Then add all the other ingredients and continue cooking for about five minutes or until the liquid has formed a thick sticky sauce and the pork is cooked. Then add pepper to taste. This goes really well with rice (preferably sticky Thai rice) and some crispy fried onions sprinkled on the top. PS – if you like, you can add very thinly sliced carrots and some very finely chopped onions and a couple of chopped chillis (if you like it spicy) to the sauce. This makes it more substantial, but it’s not strictly in the original recipe. Bon appetit!